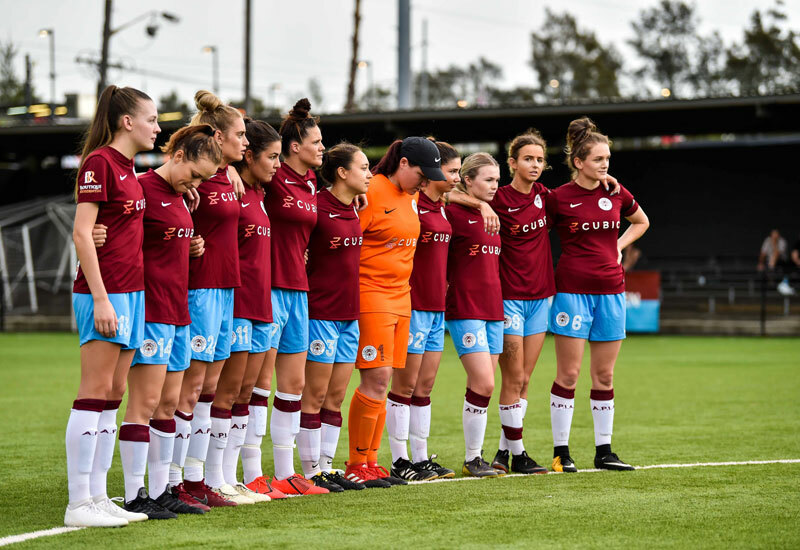 The two unbeaten sides remain top of the tree, but only by the skin of their teeth, as the fierce competition that is the National Premier Leagues 2 Womens ramped up again. There were goals, late winners and drama aplenty as teams continue to find their footing this season. Central Coast Mariners become the first side to take points off the unbeaten Gladesville Ravens as the two sides played out a scrappy 0-0 draw on a brisk night at Christie Park. The Ravens had many chances, sharpshooter Emily Diaz broke through late but was denied by a brave save from Mariners keeper Rhiannon Hines. The Ravens almost made it the late, late show when a a pair of free-kicks weren’t turned home but the leaders remain the side to beat thus far despite the stalemate. After what has been a tough opening month, the Mariners showed their mettle in their defense, they marked Diaz out of the game mostly, but there were a few golden chances that the youngsters will learn from as the season progresses. Coach Dan Barrett was buoyed by their first point since late March. On a cold night, the Ravens were determined to warm the hands of Mariners keeper Hines early. They stuck her palms with a series of shots, although Hines gathered well, it was a sign of intent. Next the opening almost presented itself for Ravens. A horror back pass opened up the space but the shot from Annalise Schiraldi fell teasingly wide of the goalframe. Next the crossbar took a battering as Emily Diaz rattled the woodwork in the 14th minute. Mariners created their first chances in the contest in the 15th minute, Gabrielle Blanch cut inside smartly before she blazed over then Kaitlyn Murphy suffered the same fate four minutes later as the game opened up. Next it was a pair of number 10’s that tried to break the deadlock. Ravens’ Yume Kashima used some smart footwork to create a chance but it was gobbled up then Jade McAtemney for the Mariners put aq free-kick on the foot of Iona Snape, but the striker couldn’t connect as the search continued. Diaz continued to be the threat for Ravens albeit from range. She uncorked a fierce shot that needed to be tipped around the corner from Hines. That was the last significant action as the teams headed for the warm change rooms locked at 0-0. The visitors almost had a gift-wrapped chance two minutes after the restart. Coach Dan Barrett urged them to press across the game, and it created a stray ball that fell to Mikala Tucker. She couldn’t force Eri Arikawa into a stop. Both keepers were safe tonight. Arikawa and Hines gobbled up chances like it was a training session, as the game drifted past the hour mark, still locked at 0-0. It seemed a moment of magic might decide this contest. Fresh on the field, Ravens substitute Amelia Vitek tried to conjure that moment. She sliced through the midfield with a stepover but her effort fizzed wide of the post. With time running out set pieces became more valuable to break the game open. Carlie Ikonomou was precise with her delivery over the dead ball all night, shot in a free-kick low which fell to Vitek, the striker couldn’t turn home then a grateful Hines gathered the follow up as the Ravens soared forward. As the clocked ticked into final five minutes, the crowd rose to its feet, as Emily Diaz picked off a defender and bore down on goal. She eyed off Hines but fired straight which allowed the custodian to clean up. Into injury time, Ravens had a chance to make it the late, late show again. Ikonomou stood over a late free-kick, tumbled an effort into the crowded penalty area but it was taken in a final act of strength from Hines, as the game ended nil-all. “It was two teams looking for a result tonight. One magical moment might have sealed it, and if we could hit it anywhere but the keeper, it is three points for us. Alas tonight, neither side could find that moment.” he said. “The girls are training hard. We’ve improved so much from last season which is pleasing. We are continuing to build to that, not peak early and do so in the semi-finals later this season.” finished Di Sciascio. “We’ve had a very disrupted season, missing five regulars for the whole season, so we’re starting again. We’re a team that plays off our effort and that showed tonight, it’s what we expect every week.” said Barrett. “What I was most happy with tonight was our pressure. They didn’t have time on the ball to truly hurt us, and the whole back four, keeper and the rest of the side were fantastic tonight.” finished the Mariners boss. Western NSW Mariners make the long trip home from Nowra happy. The Mariners triumphed 2-1 against a game Southern Branch FC side this afternoon at South Nowra Football Complex. The visitors aiming for their third straight victory kicked off the contest with a goal to Brydie Comiskey, her second goal of the season before Shaylee Meehan equalised with her first goal of the season for Southern Branch FC. Suddenly, the home side sensed glory was on the horizon. Their glory was snatched late on by the Mariners. Much like they did against UNSW FC back in Round 2, it was a winner in the final ten minutes. Young star Anna Hunt popped up to knock the ball home in the 87th minute. Her third of the season, made it 2-1 and the victory left the Mariners sat in fourth place at the completion of a big weekend in the NPL2 competition. They left it late, but Sutherland Shire FA remain unbeaten after their 1-1 draw with a robust Nepean FC side down at Harrie Denning Centre this afternoon in a cracking contest. Nepean FC would’ve got away with it too if it wasn’t for that meddling Georgia Manos. The attacker found the back of the net in the 89th minute to share the spoils. Shire FA coach Dragan Blazevic would be pleased to take a point despite not being at their usual best. For the visitors, it was a case of the best laid plans come to waste. Stefanie Trovato continued her impressive form, with her third goal of the season. Nepean continue to stand toe to toe with some of National Premier Leagues 2 Womens top sides but like last week, the plan fell apart late. Despite that Nepean FC boss Alan Tasses can be pleased for their return in three contests against APIA, Shire FA and Mariners. Those contests yielded five points. That puts them in the top half of the table, only a point out of the top five. The Stallions secured back-to-back victories with a comfortable 3-1 success against UNSW FC this afternoon at grand old Marconi Stadium today. Marconi moved themselves into the top five with today’s win. The home side struck early which put a downbeat UNSW FC side on the back foot and they never recovered. Both goals in the first half came from the set piece as well. Jessica Beale pulled out a party trick as she scored directly from a corner for the first before Jasmin Courtenay made it half a dozen goals for the season. She turned home well from another set piece as the Stallions dominated but need to be clinical in front of the goal. Fresh from the break, Stallions added a third through Ceyda Cambaz despite UNSW FC coming out with a better intent in the second half. Alexandra O’Rourke clawed back a goal for the students as the attacker was a standout for the visitors in a well beaten side. Down by the sea, it took them over an hour but SD Raiders secured a 2-nil victory against St George FC tonight at St George Stadium. For the best part of an hour, the two sides were locked in a tight tussle. SD Raiders showed their class with a pair of goals in the final 15 minutes to triumph under the St George lights. The result makes it back-to-back successes for SD Raiders FC. They remain tied on points with fifth placed Marconi, only outside on goal difference. For St George, it was a positive performance just need to add points to the final product. In the battle of the jungle, there was only one queen, that being APIA Leichhardt Tigers. They swept away Inter Lions, 7-nil on a routine night at Lambert Park. APIA continued on their free-scoring ways, as the home side were clinical in front of goal against the bottom placed Inter Lions. Ash Palombi made it nine goals for the season with her magnificent hat-trick to set Lambert Park on fire. She was helped by the efforts of attacker Logan Garard, who picked up a brace in the rout. Two of APIA’s off-season signings, Georgia Bridges and Kerrie Ryan, added to their season tally as well. Three more points make a good week for the Tigers who rose to third after this result and their 2-2 draw in midweek.